Discover the Red Centre and the South Australian Outback with an all-inclusive small-group tour. 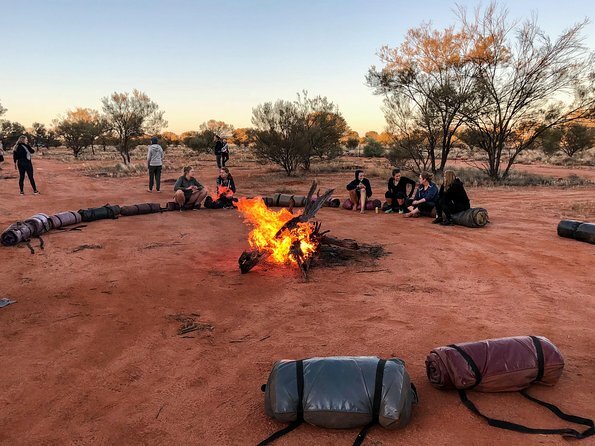 During these 6 days, walk through Watarrka National Park (Kings Canyon), enjoy sunrise at Kata Tjuta (The Olgas) and an Uluru (Ayers Rock) Sunset, visit an Opal mine and a Kangaroo Orphanage in Coober Pedy. Hike through the spectacular Flinders Ranges. Accommodation included: Kings Creek Station Campground, swag camping. Alligator Gorge Hike, Lookout View Point. The highlight excursion of my time in Australia. Excellent and knowledgeable guide with a real passion for his subject. Sleeping under the stars in a swag is an amazing experience for a city dweller. The majesty of Uluru and sunrise and sunset, Kata Tjuta at sunrise, are breathtaking. The road journey's give a real experience of the vastness of the big red interior. We cater especially for the youthful, adventure traveler and backpacker who want fun, informative, adventurous trips. We are not restrictive of age, but we do require our travelers to be young, or young at heart, with a reasonable level of fitness.